Galley Wench Tales: Australia -Cheers! a zippy Bundaberg ginger beer. Ever wonder what to do with currency not current with the country you're in? You could take it to your local currency exchange, usually best at a bank or airport. We believe we've found something better, or, at least more fun to do with it. We have this silly tradition, inspired by Wayne, to use it as a celebration, buying our first drink to welcome ourselves back to the country. The last time we did this was when we returned to the Bahamas. It took us a bit longer to use our Ozzie dollars; Wayne found a tenner from my 2007 trip to Australia when we moved after selling the last home we owned, in Vancouver Washington. 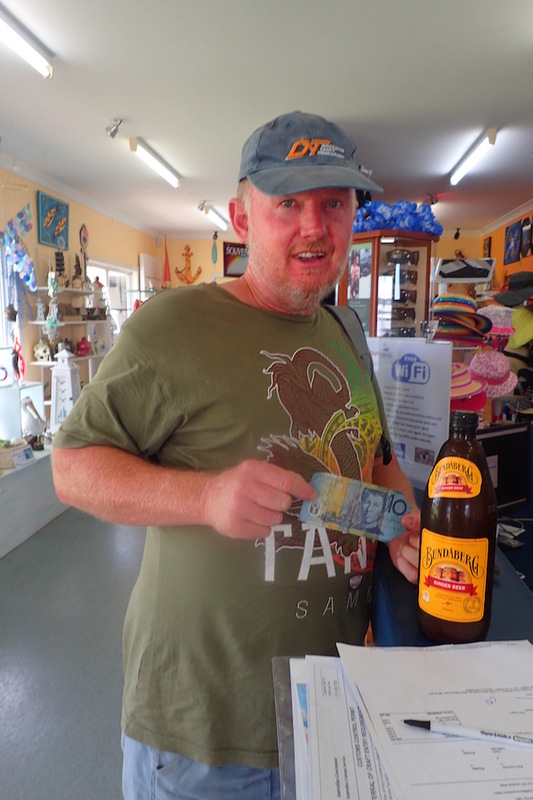 We cleared customs on November 14th, at the Bundaberg Port Marina and wasted no time buying a thirst-quenching chilled Bundaberg ginger beer from the marina office store. While there are alcoholic ginger beers, despite Bundaberg's worldwide renown as a maker of rum, their ginger beer is a simply delicious soda. Their diet ginger beer, which is pretty tough to come by, even here, is hands down by far my favorite ginger beer ever. And as a fan of that particular bubbly, I've tried quite a few. Cheers to Australia! And cheers to you - with whatever happens to be your handiest libation! And now you know what to do with that no longer current-to-your-country-currency - use it as an inspiration to return there with a cheer, or give it to a friend who can. We drank our first Ozzie drink at Bundaberg Port Marina (S24.45.618 E152.23.794), outside Bundaberg, Queensland Australia. At the moment, we are underway from there to Fraser Island, still in mobile phone wifi range. There's still some awesome stuff to share on our last country, New Caledonia, so expect a few more posts. After Fraser Island, we'll be heading South to Pittwater, near Sydney to pretty up our boat for sale. After Fraser, Mooloolaba will likely be our next stop on our Southbound passage.